Molly May Lewis is a printmaker and fine artist who has been working with Cardiff and Vale UHB for several years. The UHB began working with Molly during her time at the Cardiff School of Art and Design, which has since blossomed into an incredibly constructive and productive working relationship. 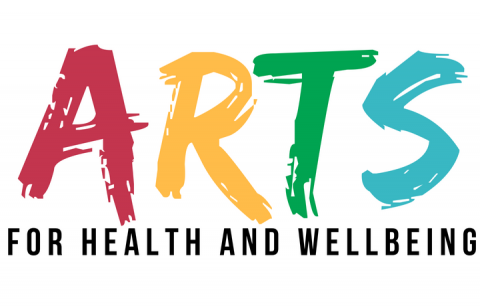 This came to fruition recently as Molly was invited to join the UHB’s Arts and Environment Steering Group, which informs the health board’s policy and strategy on the creative arts. As part of our celebrations for the 70th anniversary of the NHS, Molly created a series of 70 handmade prints which formed an installation in the special exhibition hosted at the Hearth Gallery this summer as well as a set of paper sculptures inspired by the nurses uniforms of the past. Discussing her work and her creative process, Molly said, “Printmaking has an ambiguous way of revealing its own print, with the guidance of an idea, into something both controlled and unexpected. Within my practice, I make sure that this is energised and that the placement of different shapes and compositions reveal new overlaid designs and create new colours. “The idea of preparing a print is also crucial to my process. With a passion for exploring the relationship of overlaying colour, I have used seven colours along with seven woodblock shapes in two different sizes; the larger shapes are the small shapes but increased in size by 70%. “A combination of mounted hanging prints, next to prints in handmade frames, illustrates the chaotic yet minimal and strategic way I channel my practice. As you move along the prints, starting at number one on the left hospital screen, reaching framed piece twenty-five on the wall and then through to number thirty-nine on the right hand hospital screen, the compositions of the prints get more complex and vibrant. These seventy prints are representing the seventy years of our wonderful NHS, symbolising the growth, diversity and development throughout the years. “Each etching plate within the prints, through a circular pattern, contains a number. For example print number one has one circular pattern, print number thirteen has a pattern made up of thirteen circular marks and so on. After print number thirty-five, the etching plates are then composed together to add up to the higher numbers ending with seventy which includes a total of four etchings. Simultaneously, as the etching plates increase, so do the woodblocks. You can hear Molly discuss her work in the video below. Molly was also involved in the UHB’s celebration for Pride Cymru this year, as she created the vibrant cover for our vintage hospital bed parade float from pompoms that had been donated to the Cardiff & Vale Health Charity.